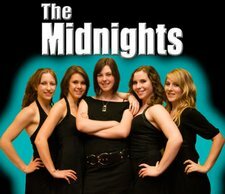 The Midnights are a group of professional musicians and students which provide mentoring and work experience for members of the Victoria High School R&B Band. This dynamic high energy show features three or more of Victoria's best up and coming singers with a finely polished presentation and superb choreography. The very best Motown and soul dancefloor favourites rejuvenated with electrifying verve make for an unforgetable experience!